In a water-using mass transfer process, different components are transported to the water (Fig. 13.7a). In the following, we will study only one component. The index i for different compounds can now be omitted. Fig. 13.7 Concentration/mass flow rate diagram. (a) Schematic of a water using process for impurity. 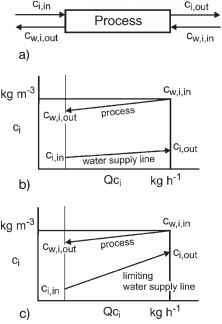 (b) A water-using process in a concentration/mass flow rate diagram, with the water profile not limited for one impurity. (c) The water profile is limited (one impurity). The concentration of this component (the impurity) decreases inside the process system and increases in the water. This can be demonstrated using a concentration/mass flow rate diagram (Fig. 13.7b). The slopes of the straight lines are the reverse of the flow rate Q. The water flow rate is very high, resulting in a low increase in the concentration ci. In Fig. 13.7c, the water flow rate Q is reduced down to the lowest possible value which is still sufficient to meet the required reduction of cin to cout. The lower straight lines are called water supply lines and the limiting line in Fig. 13.7c is the limiting water supply line. Any water supply line which is below the limiting water supply line will satisfy the process requirements. However, there are also possibilities to save water. 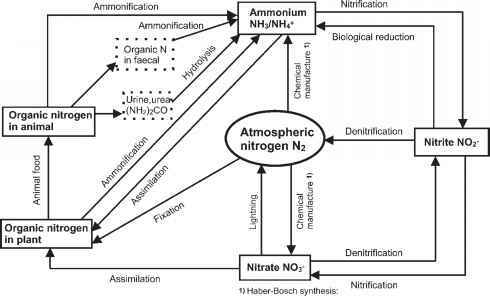 How we can find a method to save the greatest possible amount of fresh water without reducing the transferred impurities if there are four processes with different cin and flow rates Qj? We want to approach the solution step by step. The first step is to construct a concentration/mass flow rate diagram as in Fig. 13.7, one for each of the four processes presented by Fig. 13.6 and Table 13.2. All four water supply lines start at the point (q = 0, Qj q = 0), but they end at different points q_out, showing different slopes Qj (Fig. 13.8 and Table 13.2). The total water flow rate is 2Qj = 112.5 m3 h-1. The next step is a discussion with the process operators which may result in higher permissible cin values for processes 2, 3 and 4 (Table 13.3). If such a system of process water management is to be realized, the total water flow rate would have to be increased to 170 m3 h-1 (Table 13.3), much more than if using fresh water for each process (112.5 m3 h-1, Table 13.2). However, the following considerations will show a way to reduce this water flow rate remarkably. Fig. 13.8 The four processes j connected in parallel with a fresh water use of 112.5 m3 h-1 presented in a concentration/mass flow rate diagram. Table 13.3 Example for limiting process data (see Fig. 13.9a). As a part of the analysis we constructed one concentration/mass flow rate diagram for the four processes, but there are still no connections between the straight lines (Fig. 13.9a). The discontinuities in concentrations can be avoided by connecting the points as follows (Fig. 13.9b, based on Table 13.3). The water for process 1 must be clean (c1in = 0 kg m-3). So the first straight line will not be changed but the second straight line for process 2, starting at c2in = 0.05 kg m-3, meets the first line at Qc2in = 1.0 kg h-1. The straight line for process 3 follows from Table 13.3, by calculating the slope using Ac; = 0.4 -0.1 = 0.3 kg m-3 and AQjcj = 21 - 9 = 12 kg h-1, giving slope = 0.3/12 h m-3 and thus Q = 1/slope = 40 m3 h-1. Figure 13.9b presents the concentration/mass flow rate diagram for a system of four processes characterized by requirements presented by Table 13.3. This curve is called the limiting composite curve. Fig. 13.9 Limiting composite curve. (a) Limiting water profile. 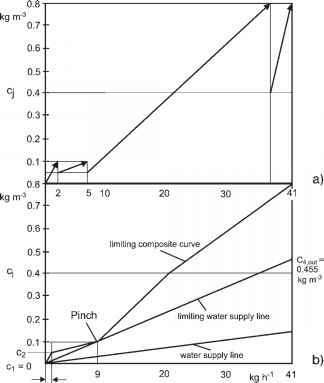 (b) Limiting composite curve with water supply line defining the minimum water flow rate. In analogy to Fig. 13.7, which presents the concentration/mass flow rate diagram for only one process, it is very interesting to find the limiting water supply line. The straight line with the lower slope plotted in Fig. 13.9b shows a water supply with a relatively high flow rate Q. The lowest possible flow rate Qmin can be calculated from the limiting water supply line which touches the limiting composite curve without crossing the line. This point is called a pinch (Wang and Smith 1994). The slope of this limiting water supply line can be calculated using cin = 0 kg m-3 and cout,max = (41 • 0.1)/9 = 0.455 kg m-3. But what network of processes do we have to build in order to save this amount of water?